Congregation Beth Jacob Rabbi Ilan Feldman introduced the global Shabbat Project to his congregants Friday morning, Nov. 11. In an online video, he said that for a long time we have kept Shabbat a secret, but it’s time to let it out on the streets. “If you have a jewel, you want to wear it,” he said. Simply Tsfat, which spent Shabbat in Toco Hills, closes the Atlanta observance of the Shabbat Project with a concert at Congregation Ariel in Dunwoody. Along with an estimated 1 million Jews celebrating the Shabbat Project worldwide, I wanted to wear that jewel. So after I lighted candles Friday night, I walked on LaVista Road. It was a crisp fall night hopping with people moving in all directions. “Are you going to Torah Day School?” asked a friend passing by. She was on her way to Netzach Yisrael, the Iranian congregation, which was sponsoring a fiesta Shabbat dinner at Torah Day School of Atlanta. My daughter was headed to a young professionals Shabbat celebration at Young Israel of Toco Hills. I had reservations at Ner Hamizrach, the Sephardic congregation, which was presenting its first dinner in honor of the Shabbat Project. At Ner Hamizrach, the tables were covered in shiny black cloths with designer black-and-white napkins. Each table held a platter of baked salmon floating in a creamy, pareve sauce. People at my table passed the fish along with bowls of spicy carrots, purple cabbage, corn salad and other delicacies traditionally served in Sephardic homes as the first course on Shabbat. After savoring those appetizers, I filled my plate at a buffet with two kinds of chicken, two kinds of rice, steamed veggies, pasta and salads. The ruach (spirit) and camaraderie were even more delicious than the excellent food. Walking from table to table, I greeted friends with “Shabbat shalom.” Some responded with “Good Shabbos,” the greeting I use in my Ashkenazi shul. Back at my table, I sat near a man who belted out Shabbat zemirot (songs) in Sephardi melodies. Next to me, a young couple from Gwinnett bounced a baby on their laps. They were staying in the area to observe Shabbat and shared their plans to move to the neighborhood. I remembered that over 40 years ago, I moved with my own young family to Toco Hills to be able to walk to synagogue on Shabbat. Men and boys dance at Congregation Ariel during the Simply Tsfat concert. The baby smiled at me. “She likes you,” said the father. I answered that she probably knows I’m a grandmother. A grandmother who wasn’t going to miss the next action that evening: a community kumzitz in a home on Biltmore Drive. Even before I walked into the Adelmans’ spacious house, I heard singing. 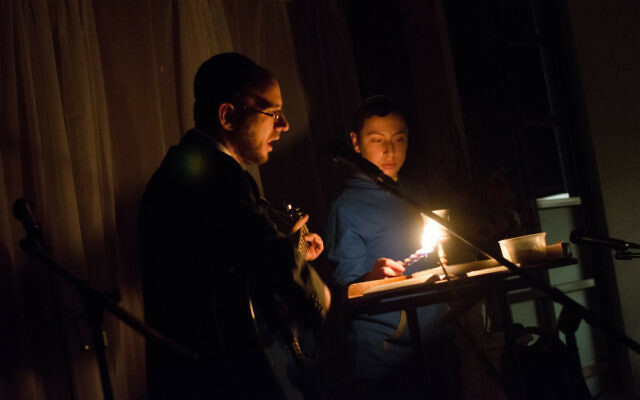 Inside, about 100 people from all over the neighborhood gathered for an oneg Shabbat. One young woman held month-old twins, nestled in each arm. A young man in polka-dot pajama pants said he had walked over from Emory Hillel’s Shabbat pajama party. 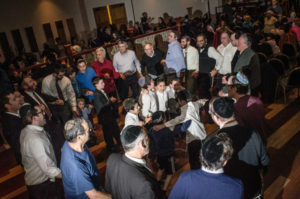 Dozens of other men in varied attire — suits, shirt sleeves, streimels, black hats and kippot — sang and linked arms around the long dining room table. Their faces were as bright as the candles I lighted at home. Their voices rose to the high ceiling as they swayed to the rhythm of Shabbat. 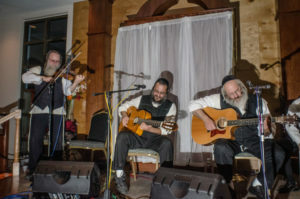 Among the men were the three members of Simply Tsfat, a hasidic Israeli-American group that performed a Havdalah concert the next night at Congregation Ariel in Dunwoody. Saturday morning brought a major highlight of the Shabbat Project in Toco Hills. After Shabbat services, members of congregations in the community and their guests, along with high school and college students, met after services in the front parking lot of Congregation Beth Jacob for a block party Kiddush luncheon. Early that morning, Sybil Goldstein, the event coordinator at Beth Jacob, and Lydia Schloss, co-owner of the Spicy Peach, directed volunteers in that front parking lot, where 700 seats were set up at 60 tables, filling one end of the parking lot to the other. By 11:30 a.m. most of those seats were filled. Rabbi Emanuel Feldman, visiting from Israel, recited Kiddush before we sat down to the first course of sushi and fresh veggies. Buffets held main entrees of chicken and side dishes whose aromas filled the air. I sat next to some of the women from Beth Jacob’s Kiddush committee, who said they prepared 60 trays of fresh vegetables and 60 trays of cookies. “Try the tomatoes. They’re really delicious,” one of them said. I did, and they were. Although the day started out cool and hazy, the sun peeked out from the clouds and added to the warmth of the gathering. So did the singing and dancing led by Simply Tsfat. It was the second year that Beth Jacob, in substantial partnership with Young Israel and with support from other synagogues and institutions in the area, sponsored the block party as part of the Shabbat Project. Beth Jacob’s administrative staff and dozens of volunteers worked to make the Kiddush luncheon a success. Even the children at Beth Jacob preschool prepared for the event, decorating white boxes to hold plates, napkins and utensils for each table. It truly was a Shabbat shalom in Toco Hills, a jewel that sparkled in the sunlight.